WBZ reports the Acela passengers were a bit less than pleased. 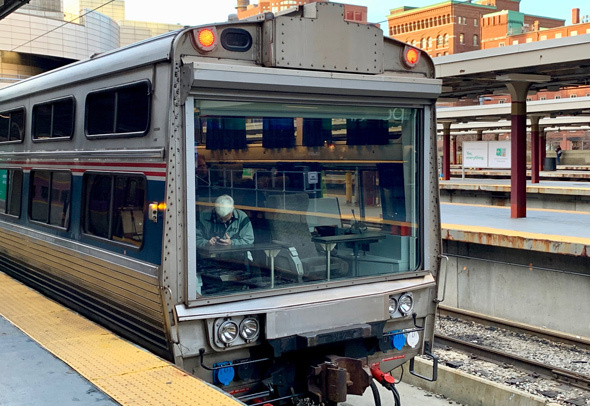 Jed Hresko spotted this unhappy Amtrak baggage car at South Station yesterday. 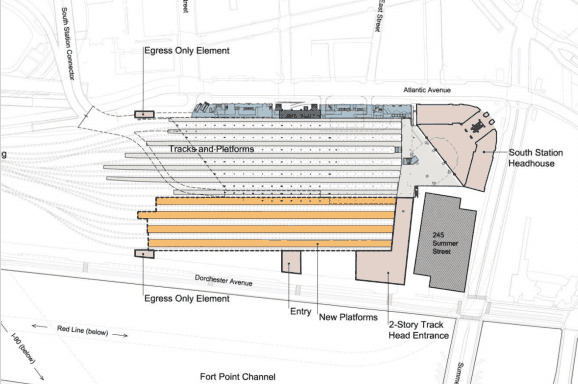 A MassDOT environmental report details plans to expand South Station over nine years that would hinge on getting the Postal Service to finally abandon its giant facility along Fort Point Channel and moving the food-distribution companies of Widett Circle someplace else. Read more. State officials announced today they'll be shutting Commonwealth Avenue near the BU Bridge July 26 to Aug. 14 as they work to replace the increasingly creaky bridge where the street crosses over the turnpike and the tracks used by the Worcester Line and Amtrak's Lake Shore Limited service. Paths will be kept open for pedestrians and bike riders, MassDOT announced today. Read more. NBC New York reports on the incident involving Acela Express 2151, which derailed as it was pulling into Penn Station around 9 a.m., then hit a New Jersey Transit train. Gentlemen, you can't talk in here - this is the Quiet Car! David Yamada ponders the sort of people who think the first rule of Acela Quiet Car (namely, "Be quiet!") doesn't apply to them and what to do about that. This morning's switch problems at 128 have morphed into signal problems at Canton Junction and so Keolis is warning of Trump-level (you know, yuuge) delays on the Providence and Stoughton lines. Due to a switch outage near Route 128 Station, Amtrak and commuter trains are experiencing delays moving through the area. Amtrak engineering forces are on the scene and are working to resolve the issue as quickly and safely as possible. WBZ reports an overnight train from Washington to Boston stopped in the Bronx around 3 a.m. and then just sat there for nearly four hours, with passengers trapped inside without any heat. The Boston Business Journal reports the T and Amtrak have resolved a legal beef that at one point led to Amtrak threatening to terminate Acela service north of Providence. Read more. The two rail operators are telling a federal judge they're maybe a month away from resolving a $29-million dispute over the cost of Northeast Corridor service in Massachusetts. Read more. At least one train has already been cancelled as police investigate the 12:30 p.m. incident, but the T is bracing passengers to expect "significant delays." Mansfield Police report the person is dead - on a stretch of tracks where Amtrak trains travel at well over 100 m.p.h. The Boston Business Journal reports Amtrak hopes to have the new trains barreling down the tracks by 2021, which is roughly when the T hopes to have the new Red and Orange Line trains mostly on the tracks. A dispute over whether Massachusetts should pay Amtrak $29 million for Acela service over tracks the state owns got ugly this week when the national railroad filed a court document suggesting it might have to stop service north of Providence rather than continuing to deal with the "chronically delinquent" MBTA. Read more. The T is warning of delays up to 50 minutes on the Providence Line due to "an Amtrak signal issue near Attleboro Station."